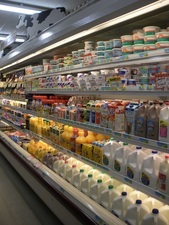 We offer the Milk Club Card program - Ask any one of our cashiers for a card. You buy 12 gallons or 12 half gallons of milk and get the 13th one FREE! We feature many varieties of Dimock Cheese, made in South Dakota.